Well, well, well. 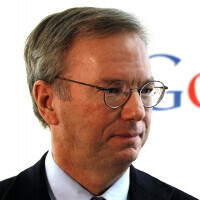 After being caught back in March with an iPhone in his hand, Alphabet executive chairman Eric Schmidt admitted today that he owns an iPhone in addition to an Android handset. Alphabet is Google's parent company. Back in 2009, Schmidt was caught taking photographs with a BlackBerry. But in his defense, that was months before Android 2.0 was released inside the Motorola DROID, the move that many historians call the beginning of Androidmania. Schmidt, back in 2013, penned a guide to help iOS users make the transition to Android. So that makes his use of an iPhone a little more Benedict Arnold-esque than when he used a 'Berry. 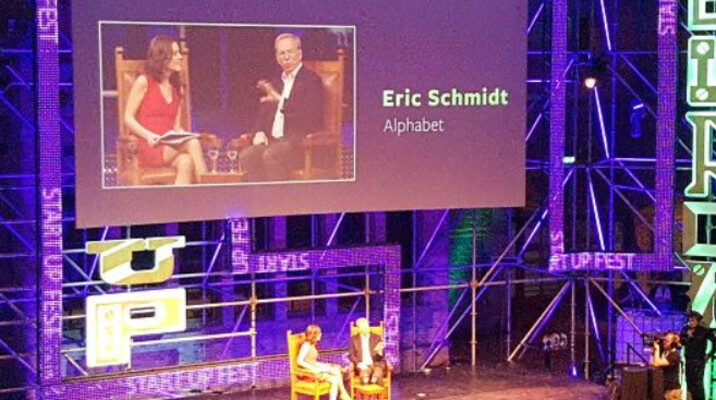 Yesterday at Startup Fest in Amsterdam, Schmidt told the audience that in addition to his Samsung Galaxy S7, his smartphone arsenal includes the Apple iPhone 6s. Actually, owning a rival's phone is a schrewd move for Schmidt, as it allows him to see what the competition is doing. And don't forget that Google has a number of iOS apps that Schmidt might want to monitor from time to time. So Mr. Schmidt, which of those two handsets is better? "Samsung S7 is better," Schmidt said. "It has a better battery. And those of you who are iPhone users (know) I'm right," said the one-time Google CEO. Trump is bashing Apple for manufacturing over seas... Trump manufactures out of the US. Trump has investments in Apple. Manufacturing in the US would put the cost of the iPhone to $1400 if I remember correctly... BTW. People will still vote Trump because he is such a "Smart" guy. Let him start WW3 with his big mouth. Do you understand why people are bashing Trump? You forgot to mention he's a woman hating bigot who has zero understanding of international politics. He actually thinks he can build a wall between the border and Mexico.....and have the Mexican government pay for it!!!!!! LMFAO :D.
Smart or not i think people just want someone different. It would be an entertainment whatching him elected. Entertaining isn't quite the word I'd use. Though you're mostly right, people are tired of the establishment. That's part of the reason for his rise. We'd be foolish to overlook the underlying forces that made his presidential bid viable. Wait a minute... You're an American? You, who goes out of your way to make demeaning statements about America and insulting nearly the entirety of our citizenry whenever you get a chance... Are an American. Gotta admit, I wouldn't have called that. You'd be punishing the entire country. SHe is pretty much dumb like Trump...! Making the iPhone in the US would not change it pricing at all. That is a claim that has been proven to be false. If Apple did increase the cost, it would be to too keep profits margin s high as possible, because they would end up losing money due to taxes and salaries and benefits. Since the iPhone is already being sold for 300%+ minimum what it costs to make, they would make more than enough money to keep the price the same. This lie has been told so many times. and is clearly false. You fools will make any excuse for the tax dodging Apple. But what we can agree on is what you said about Trump. He also spoke of Apple hiding money offshore to prevent paying taxes on the money they've been making. That is exactly why it would increase the cost. These companies choose to make their products in countries where they don't have to pay their workers much of anything, and refuse to support their own countrymen with jobs. Who they then turn around and expect to buy their products. Frankly, it is disgusting to me. It's unpatriotic, it is destroying our land, and they need to be heavy penalties enacted against them or at least some supremely attractive incentives in place to stop this practice. Or both. And the unpatriotic practices of inversion and tax evasion are even worse. Outsourcing is killing us. They want to stay here, reap the benefits of being an American company and do everything in their power to not support Americans. Screw them all. I don't recall Schmidt ever telling people to boycott Apple. Also, as mentioned in the post, Google has 70 iPhone and 54 iPad apps. I'm confused what SJW's have to do with anything relevant to this article or discussion. Nor do I get why criticizing Trump would automatically make you an "SJW", as if it's impossible to have legitimate reservations about him and his character or to disagree with his ever-shifting policies. Reservations about good character? I'm flat out saying he's a liar. He's always been a low life, and he's possibly the only candidate that could make me vote for Hillary. I agree with you, as he is. But I was trying to state it delicately. You know how it goes, I didn't feel like getting dragged into a pointless argument with some angry commenter and having them focus on what wasn't my main point. I would argue Ted Cruz would have the same effect. Except Eric Schmidt was NOT a founder of Google. Larry Page and Sergey Brin are. So there is no double standard. Eric was the one time CEO, long ago, and left before Android got to the point of what it is today. It doesn't matter, because his argument about double standards literally made no sense. Nobody at Google called for a boycott of Apple for anything. There is no comparison to be. I don't know about those you call SJW, because that term gets throw around a lot, but it seems a smart move to own a rival product? so you can actively follow the development of it and counter it in advance? smart business move? Also 'owning' doesn't mean it is his daily phone. Who Cares??? Well, I cared. Exactly. Google makes apps for all platforms, especially since once upon a time they didn't have their own. The reality is, it just doesn't matter what phone he carries. I have stated that a CEO shouldn't carry a competitors product in public, because it create BS banter like this article. Some companies have rules that forbid employees of being seen in uniform using another competitors product. Tech companies I don't think have this rule because they tend to be software devs or hardware manufacturers that have to make product for multiple brands. So seeing an employee using another brands product is not uncommon. Example, Apple used Silicon Graphics workstations to design the Mac. Microsoft used the Mac to design and build the Surface. One of the reason could be that Macs have better support for OpenGL vs Windows and thus when you are designing something so delicate as hardware for example, seeing the best possible graphics is critical. Sure CAD works just as good on Windows as it does any Mac. But the Masc has been the defacto standard in such, and many companies use them. After all Microsoft makes software for Macs too and thus having them in-house for design and testing purposes seems to be a smart idea. You think Apple doesn't have Windows PC's? You think Steve Jobs never used a Windows PC? Why is it such a big deal that a Google BigWig is found using a phone which his company makes software for? What? Better battery? That's not convicing! To me, both phones are not perfect. It's just the preference. I can tell you this from experience battery life on ANY Android device is worse than the iPhone. In general iOS performs much better with less battery life used, than Android.